Unfortunately, there’s no way to review this book or discuss the book that it’s in response to (“Strange Fire” by John MacArthur) without talking about personalities. That said, while I am a Charismatic, Michael Brown is far more Pentecostal than I will ever be – or want to be. And while I’m Reformed, John MacArthur is far more Calvinistic than I will ever be – or want to be. After reading this book and considering the output from the Strange Fire camp (including the book of that title) I find myself somewhere between the two men. Let’s start with this book. While I concur with most of what Michael Brown and his appendix authors present in this book – particularly their superb exegesis of scripture – I was troubled by the recurrence of that oldest of Pentecostal fallacies: An over-reliance on anecdotal evidence. This is particularly troubling to me since, as a Mormon Studies Scholar, I’m all too familiar with cults and other unorthodox groups citing anecdotes and experiences as though they’re conclusive, objective, empirical evidence. Folks, they’re not, they’re just not. While to some this may seem a niggling gnat straining point, it’s not since Charismatics are often (and not without reason) accused of elevating experience above biblical authority. This the very thesis that forms the core of MacArthur’s book and the one which he gleefully hammered away at for 352 pages, through an entire conference, and now continues through countless tweets and articles. For example, I was troubled by Brown’s frequent reference to being slain in the Spirit (or “falling under the power of God” as he more often referred to it in the book) as if it were a “biblical given” based on his experiences and stories. The fact is that it appears exactly nowhere in the Bible (that is unless you eisegete it into the text). This is a glaring hole in this book. By relying on anecdotes, in my opinion, Brown and some of his co-contributors have left themselves open and exposed for even more criticism from the Strange Fire camp. That said, I thought that they did an excellent job of exposing the glaring hole in MacArthur’s book in particular and his stance in general: His failure to exegete from the entirety of scripture and tendency to exegete only from select texts. For example, nowhere in his book does he address 1 Corinthians 14 where the public use of the “sign gifts” (to use a cessationist term that never appears in the Bible) of congregational prophetic utterances and tongues is not only commended, encouraged, and endorsed but given a practical framework in which they are to work in the local church. Another example is his failure to address the last words in the Bible on the practice of charismata which are: “Therefore, my brethren, desire earnestly to prophesy, and do not forbid to speak in tongues.” (1 Corinthians 14:39, NASB) Respectfully, Mr. MacArthur, if you truly respect the authority of scripture and the authority of the foundational teachings of the Apostles of the Lamb then you can neither ignore this Biblical mandate or criticize others when they respect and obey it. So clearly there’s bias on both sides – to the surprise, I’m sure, of no one. So the question is, who makes the most compelling case? In my opinion, it’s Michael Brown and his appendix authors. They present a compelling and cogent case that’s truly “sola scriptura” rather than “sola scriptura AND”. The “AND” in this case are renowned historical figures of the Protestant Reformation in general and John Calvin in particular (for example, consider “Calvin’s Critique of Charismatic Calvinists” by Steve Lawson from the Strange Fire conference for a glaring example of this). Yes, I’m Reformed but I refuse to put a pinch of incense on the altar of John Calvin, Jonathan Edwards, Martin Luther, or anyone else in addition to declaring Jesus Lord and the scripture His gave us the absolute, final authority for this mortal passage. Michael Brown and the appendix authors very rightly call the Strange Fire camp to task for this. Above: In contrast to Michael Brown’s calm, reasoned, and thoughtful response to Strange Fire, Pentecostal preacher Perry Stone demonstrates how NOT to respond. Last but not least, I’m not as nice as Michael Brown (after all I am one of those cranky, scholarly, truth-oriented, confessing, and Bible thumping, Reformed folks). So I’m just going to say it: John MacArthur can be a real bully. I say this while at the same time happily acknowledging all the wonderful benefit that I’ve derived from listening to more than my fair share of his excellent books and sermons over the years. I honor his gifting as a Bible teacher, expositor, and theologian. However, I’m not blind, nor am I deaf and it’s hard to miss the harsh, ungracious, even mean-spirited jabs that I have heard him take at those he differs with over the years – and that includes cessationists, continuationists, and even other Reformed theologians. It seems that you risk a declaration of war if you dare disagree with Mr. MacArthur. Pentecostals and Charismatics may be his favorite target but they’re far from his only target. Further, after the harsh and uncharitable hatchet job that he did on John Wimber and the Vineyard Movement in 1993 (full disclosure, I and many other Charismatics were critical of the excesses in the Vineyard at the time as well) in “Charismatic Chaos” as well as the seemingly endless stream of exaggerated, unkind, unmerciful, and ungracious articles and sermons he has preached against Pentecostalism over the years neither his book or his conference came as any surprise – it was just par for the course only with a new club. Particularly troubling was his comment in “Strange Fire Panel Question and Answer, Session 1” that, “I believe that we are not dividing the body of Christ in this conference. We are trying to identify the body of Christ and show that these people aren’t part of it“. With that statement (which garnered applause from the audience) Mr. MacArthur has just thrown a half a billion Pentecostal/Charismatic Christians under the bus as not belonging to the body of Christ. This isn’t theory or hyperbole, the fruit of the “license to kill” and relentless unkind, vitriol that he has on Pentecostals and Charismatics can readily be seen in the mean spirited memes and posts that fill the Reformed groups on social media. Clearly John MacArthur and the Strange Fire camp has unleashed something is hard to describe as “Christian”. This is unfortunately and, frankly, I would expect more of someone of Mr. MacArthur’s maturity, stature, and position within the body of Christ. However, given the prejudiced model of bigoted bullying that MacArthur has modeled in Strange Fire and his two prior works on the Charismatic Movement (1978’s “The Charismatics” and 1993’s “Charismatic Chaos”) it’s no wonder less mature Christians feel the freedom to do the same. But with that said is this response to all this bludgeoning perfect? No. However, given the ungracious, unkind, and unfair nature of the Strange Fire onslaught it needed to be written and, as other reviewers have noted, it does a fine job of addressing, as one pastor put it so well, “the strange theology of John MacArthur’s Strange Fire”. But more than that it stands up to a bully – and that’s never a bad thing. 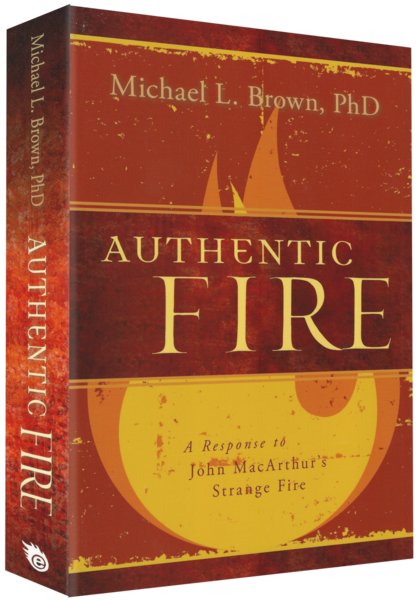 First, please read John MacArthur’s book and consider the Strange Fire conference addresses (which can easily be found on the internet). Please don’t take my, Michael Brown, or anyone else’s word for what they’ve said and the way they’ve said it. Frankly, I think that it speaks for itself. Suffice to say, in my opinion, the strong criticism that these materials have received from both the cessationist and continuationist camps is well deserved! MacArthur has since tried to reposition it all as “the start of a conversation”, however, the tone, content, and rhetorical style is clearly something else. Second, some of the best material in this book (Authentic Fire) is in the appendices. Don’t skip them. In fact, I recommend that you first read through them starting with, “Why NT Prophecy Does NOT Result in ‘Scripture-quality’ Revelatory Words (A Response to the Most Frequently Cited Cessationist Argument against the Contemporary Validity of Spiritual Gifts)” by Sam Storms. This is Appendix B. Frankly, I wasn’t too impressed with Craig S. Keener’s Appendix A (“The Ongoing Evidence of Miracles, with Thoughts on African Charismatic Christianity”) due to its over-reliance on anecdotal evidence. In fact, in my opinion, you could just skip it without missing too much. However, I should probably add that Keener’s review of Strange Fire (which be read by clicking here) is superb and brings much to the conversation – it more than compensates for any deficiency in his contribution to Authentic Fire. Third, The Pneuma Review published a superb panel discussion of Charismatic leaders and thinkers back in October 2013 in the fall out of the Strange Fire Conference (circa October 16-18, 2013) as web portal page. Everyone from Tim Challies to Adrian Warnock is present. There are hours of reading and it’s well worth your time. Click here. Finally, in addition to this book I highly recommend that the reader works through Don Horban’s superb teaching series, “The Strange Theology of John MacArthur’s Strange Fire” which can be found by clicking here. Pastor Horban addresses many issues and points that were missed in this book. It is an excellent supplement to the Authentic Fire book and a masterful response to the Strange Fire camp. Book Review: “The Charismatics” by John F. MacArthur, Jr.